When you think of Arabia today, you think of oil, and unimaginable wealth. But less than a century ago, oil had yet to be discovered. The region was poor and one of its main sources of income - pearl fishing - was about to be killed by cheap competition and the intransigence of colonial administrators, writes Matthew Teller. "Yusuf was ready to dive. He took his basket, holding it by the rim, and [twisted] one leg about the rope with the stone. Down he went, down, down. I could watch him drop three, four fathoms. Then he was gone." So wrote Australian explorer Alan Villiers, describing a pearl-diving expedition off Kuwait in 1939, in his book Sons of Sindbad. "How long he was down! There was silence aboard. [Then came] a slight tug [on the rope] and the tender was hauling in fast, hand over hand. It was a long time before I saw any sign of Yusuf, deep below. A smudge became the blurred outline of a man. "Here he came, breaking water at last. His basket first, well-filled with oysters, then his old head with an arm thrown up to shield his water-tired eyes from the glare of the sun. He blew once, like a whale." Villiers knew he was lucky to see, and photograph, the last gasps of an industry - pearl-diving - which had sustained Arabia's coastal communities for generations. Since the 1920s Japanese cultured (artificially produced) pearls had flooded the world market, their cheapness and abundance fatally undercutting Arabia's labour-intensive harvesting of natural pearls from the oyster banks beneath the warm waters of the Gulf. Pearl-diving was incredibly taxing. A diver would coat his skin in oil, plug his ears with cotton wool, don leather sheaths on fingers and toes for protection against razor-sharp rocks, hang a rope basket around his neck and seal his nostrils with a nose-clip. 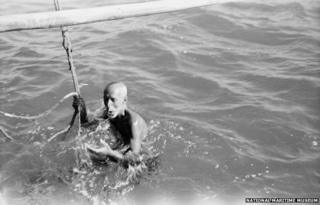 Holding a heavy stone tied with a rope, he would sink to the oyster-beds, as much as 60 feet (18m) down. An assistant on deck pulled up the stone while the diver scraped oysters off rocks with a knife, storing them in his neck-basket. When his lungs could take no more, he tugged on a line and was hauled up to the surface to recover. This would be repeated perhaps 30 times a day, with divers pooling their oysters on deck for opening under the captain's watchful eye. Between May and September hundreds of wooden ships headed out to the oyster banks from Gulf towns including Kuwait, Bahrain, Dubai and Abu Dhabi - all, then, small fishing harbours. Crews of divers, pullers and apprentices lived on board in incredibly cramped conditions for weeks at a time. Sea shanties from that era are kept alive by the old pearling families. British Library ethnomusicologist Rolf Killius recorded one particularly bluesy, evocative session in Qatar in 2013. Everyone was in debt. The divers were advanced money by their captain against a share of the boat's profits; if one year was bad, they would begin the next in the red, with debts accruing year on year. The captains were in debt to pearl merchants, who loaned money to finance voyages - and the merchants were frequently in debt to buyers further up the chain. High demand from India and Europe kept the trade going. In 1865 Bahrain - the centre of Gulf pearling - reportedly made a profit from pearls of around £30m in today's money. At its height, in 1904-05, the industry was worth more than £100m. Yet pay and working conditions remained terrible, as ruling families and the colonial power, Britain, resisted ideas of modernisation. They seem to have feared that new ways of working would bring social instability. Refusing to allow technological innovations such as deep-sea diving suits, Britain spread the idea that - as diplomat Hugh Biscoe wrote in 1930 - "anyone using artificial aids for diving incurs great risks". Such intransigence killed off any chance of the Gulf competing against the new cultured pearl business, long before the outbreak of World War Two. A generation lived in desperate poverty - until large-scale oil production, from the 1950s, suddenly changed everything. British Library curator Mark Hobbs contributed original research for this article. Click here to see the original of the vocabulary of diving terms. Alan Villiers' photographs, in the collection of the National Maritime Museum, can be seen here.